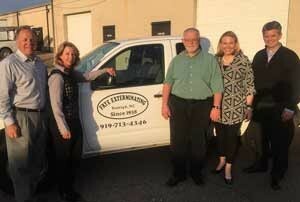 From left are Arrow Exterminators’ Kevin Burns and Marie Horner; Frye Exterminating Owner Les Preece; and Arrow’s Emily Thomas Kendrick and Tim Pollard. Atlanta-based Arrow Exterminators acquired Frye Exterminating Inc., founded in 1938 and located in Raleigh, N.C. This transaction further strengthens Arrow ‘s presence in the Research Triangle region of North Carolina, the company says, and allows it to expand and reach more residential and commercial customers in growing cities such as Raleigh, Durham, Cary, Wake Forest. “When we started exploring selling our business, we were looking to find a company that treats their employees very well and also provides exemplary customer service. We certainly found that in Arrow Exterminators. We have always said ‘a business that values family, values customers,’” says Frye Owner Les Preece. The company joins other Arrow Exterminators office in the Research Triangle area and will ultimately operate as Arrow Exterminators.